Reminiscent of a Mediterranean villa with its leisure-focused lifestyle and grand design, Acqualina Resort is Florida's only hotel of its kind built completely open to the sea. The resort features three oceanfront swimming pools, a marine biology inspired kid's program, three restaurants including Il Mulino, New York and an award winning two-story ESPA spa with indoor and outdoor relaxation lounges, Crystal Steam Rooms, Finnish Saunas, and Experience Showers. Guests can experience a heightened level of modern elegance with Acqualina's new opulent room design inspired by echoes of surf, sand and shimmering water. The new rooms and suites will be dressed in cool, calming tones featuring a selection of traditional furnishings in a deep ebony color, finished in a rich, high gloss lacquer with inflections of bronze jewel tones. Satin draping will frame windows and sliding glass doors that give way to oversized balconies with views of the ocean or Intracoastal Waterway. Glamorous detailing includes channel tufted walnut wrap around headboards, curvaceous pillow back sleeper sofa, a Chinchilla blanket, and signature wing-back chairs fit for a prince or princess. The new rooms and suites are dressed in cool, calming tones featuring a selection of traditional and contemporary elements. Satin draping frame the windows and sliding glass doors that give way to oversized terraces with views of the ocean or Intracoastal Waterway. Glamorous detailing includes channel tufted walnut wrap around headboards, curvaceous pillow back sleeper sofa, a Chinchilla blanket, and signature wingback chairs fit for a prince or princess. Classic Suite: These suites feature a king-size bed, separate living room, custom curved sofa sleeper, signature style wingback club chair, smoked glass and bronze metal coffee tables, desk chair and dining chairs, writing desk, taupe lacquer dresser with integrated media connectivity, two high-definition TV’s, mini bar, private dining terrace and 185-sq.-ft. bathroom with imported marble flooring, double sinks, custom vanity area, bathtub and glass-enclosed couples’ shower. (1010 sq. ft.enclosed; 1180 sq. ft. with terrace). Deluxe One-Bedroom Oceanfront Suites feature a premium oceanfront view, bedroom with king-size bed, separate living room, sofa sleeper, credenza with integrated media connectivity, club chairs, smoked glass and bronze metal coffee tables, dresser and desk with bronze glass inlay, desk, desk chair, ottoman, day bed with twin mattress, signature style wingback club chair, high-definition TV’s, minibar, sitting area, private terrace, gourmet kitchen (with sub-zero built-in refrigerator/freezer, designer granite countertops with full back splash, Italian limited-edition cabinets, microwave, dishwasher, stainless-steel sink and garbage disposal) and breakfast room. The 220-sq.-ft. main bathroom is outfitted with imported marble flooring, double sinks, custom vanity area, Jacuzzi whirlpool tub and glass-enclosed shower. (1430 sq. ft. enclosed area; 1660 sq. ft. with terrace). Both Deluxe Three Bedroom Oceanfront Suites feature three bathrooms, private terraces with stunning views of the Atlantic Ocean. Each suite is equipped with a large living room, custom curved sofa sleeper, taupe lacquer credenza with integrated media connectivity, smoked glass and bronze metal coffee tables, a signature style wingback club chair, desk chair, two sitting spaces including a media area with a high-definition TV, the latest in gaming consoles with an embedded DVD and Blu-Ray player plus a reading area with custom built sofas, a writing desk and a wine bar station. Each suite features a full gourmet kitchen with Sub-Zero built-in refrigerator/freezer, designer granite countertops, microwave, dishwasher, stainless-steel sink, and fully stocked mini bar. The dining area with bay window and floor to ceiling views of the ocean in each of the suites seats six persons. The oceanfront master bedroom in both Deluxe Three Bedroom Oceanfront Suites features a king size bed, walk-in closet, high-definition TV, Sony Dash Personal Internet Viewer allowing guests to surf their favorite parts of the internet including weather, traffic, social networking, movies, music and more. The 220 sq. ft. master bathrooms feature imported marble flooring, double sinks, custom vanity area, Jacuzzi whirlpool tub and glass-enclosed shower. The family bedrooms feature a full private bathroom and two twin beds. The guest bedrooms feature a king size bed and are adjacent to a full bathroom that is also accessible from the living room area. Both the family and guest bedrooms in each Deluxe Three Bedroom Oceanfront Suite are equipped with 42" TVs, Bose Entertainment Units, iPod docking stations and a terrace with a view of Miami's skyline. Deluxe Two-Bedroom Oceanfront Hotel Suite These hotel suites offer king-size beds in both the master and second bedroom, premium oceanfront views, separate living room, custom curved sofa sleeper, taupe lacquer credenza with integrated media connectivity, signature style wingback club chair, smoked glass and bronze metal coffee tables, dresser and desk with bronze glass inlay, desk, desk chair, ottoman, day bed with twin mattress, high-definition TV’s, entertainment unit, private bar, sitting area, private terrace, gourmet kitchen (with Sub-Zero built-in refrigerator/freezer, designer granite countertops with full back splash, Italian limited-edition cabinets, microwave, dishwasher, stainless-steel sink and garbage disposal), breakfast room, powder room and two full bathrooms outfitted with imported marble flooring, double sinks, custom vanity area, bathtub and glass-enclosed shower. The master bedroom offers oceanfront views and the second bedroom offers Intracoastal views. (2035 sq. ft. enclosed area; 2379 sq. ft. with terrace). The Grand Deluxe Three Bedroom Oceanfront Suite is a one of a kind accommodation with breathtaking views of the Atlantic Ocean. The suite's elegant styling and contemporary glamour carries the magnificent ocean grandeur throughout the interior design with its luxurious contemporary fabrics, soothing color palette, and marble. The elegant entry foyer with chic marble flooring has three round mirrored sconces, a linear polished nickel light fixture, and hand-painted wallpaper. The suite's expansive living room features modern end tables with a geometric design pattern, a 65-inch 4K TV and a flush mount chandelier. The sitting area has a queen sleeper sofa with quilted back cushions and accented pillows, an antique brass coffee table, and an area rug. There is also a serene gathering area with a sleek writing desk and lounge chairs for four. A full gourmet kitchen has designer Arctic white quartz countertops with full backsplash, a Sub-Zero built-in refrigerator/freezer, microwave, dishwasher, stainless-steel sink, and fully stocked private bar. The dining area has a Ralph Lauren Baxter metal shade chandelier, bay window and floor-to-ceiling views of the ocean, two bar stools and a dining table for four people. There a three bedroom options including an oceanfront master bedroom with a king-size bed, bedroom with a queen bed, and a bedroom with two twin beds. All beds are outfitted with Frette duvet covers in light grey. There are three private bathrooms. 2,031 sq. ft. (188.7 sq. m) of enclosed area; 2,375 sq. ft. (220.6 sq. m) with terrace. Oceanfront Rooms boast an oceanfront view, king-size bed, foyer area, custom curved sofa sleeper, smoked glass and bronze metal coffee tables, desk chair, high-definition TV, mini bar, private terrace and bathroom with imported marble flooring, double sinks, custom vanity area, bathtub and glass-enclosed shower. (615 sq. ft. enclosed area; 725 sq. ft. with terrace). One Bedroom Oceanfront Suites: These hotel suites feature an oceanfront view, bedroom with king-size bed, separate living room, sofa sleeper, credenza with integrated media connectivity, club chairs, smoked glass and bronze metal coffee tables, dresser and desk with bronze glass inlay, desk, desk chair, high-definition TV’s, mini bar, sitting area, private terrace, gourmet kitchen (with sub-zero built-in refrigerator/freezer, designer granite countertops with full back splash, Italian limited-edition cabinets, microwave, dishwasher, stainless-steel sink and garbage disposal), breakfast room and one-and-a-half bathrooms. The 220-sq.-ft. main bathroom is outfitted with imported marble flooring, double sinks, custom vanity area, Jacuzzi whirlpool tub and glass-enclosed shower. Also features a convertible den with writing desk and twin-size bed. (1430 sq. ft. enclosed area; 1660 sq. ft. with terrace). Two-Bedroom Oceanfront Hotel Suite: These oceanfront hotel suites offer a master bedroom and second bedroom both with king-size beds, separate living room, custom curved sofa sleeper, taupe lacquer credenza with integrated media connectivity, smoked glass and bronze metal coffee tables , dresser and desk with bronze glass inlay, desk, desk chair, high-definition TV’s, entertainment unit, private bar, sitting area, private terrace, gourmet kitchen (with Sub-Zero built-in refrigerator/freezer, designer granite countertops with full back splash, Italian limited-edition cabinets, microwave, dishwasher, stainless-steel sink and garbage disposal), breakfast room, powder room and two full bathrooms outfitted with imported marble flooring, double sinks, custom vanity area, bathtub and glass-enclosed shower. The master bedroom offers oceanfront views and the second bedroom offers Intracoastal views. Also features a convertible den with writing desk and twin-size bed. (2035 sq. ft. enclosed area; 2379 sq. ft. with terrace). Outfitted in the latest in strength and cardiovascular equipment, the oceanfront fitness center is where trained professionals will assist guests in refining their work-out regimen. Four oceanfront meeting rooms offer guests a perfect setting for small meetings ranging in size from 10 to 40 persons and parties for up to 130 persons. Meeting rooms are equipped for high-speed Internet access, individual sound systems and temperature control. Acqualina’s tented lawn areas can accommodate weddings and other special occasions for up to 200 persons for a reception and 130 persons for a sit-down dinner with dance floor and entertainment. Acqualina’s three oceanfront swimming pools are just steps from the 400 foot stretch of stunning white sand beach offering lounge chairs, umbrellas, beach tents and water sports. A tranquility area featuring an adults only pool, heated jet pool, and poolside cabanas is the perfect place to indulge in Rosewood Hotels’ Hot Type program, which provides advance copies of the latest reads. Within a 15 mile radius, there are five world-class and championship level golf courses where Miami Beach vacationers are welcome to hit the links. The courses nearby include The Diplomat Country Club, The Club at Emerald Hills, Turnberry Isle Golf, Miami Beach Golf Club, & Hillcrest Golf Club. Arrangements for golf are available through Acqualina's concierge. Acqualina Resort guests enjoy tennis privileges at the nearby Turnberry Isle Resort and the Diplomat Resort. Arrangements for tennis are available through Acqualina's concierge. Miami's top-rated hair salon, Acqualina Hair Salon by VOI offers hair cutting, styling, extensions, and the latest color techniques along with manicures, pedicures, body waxing, and more. 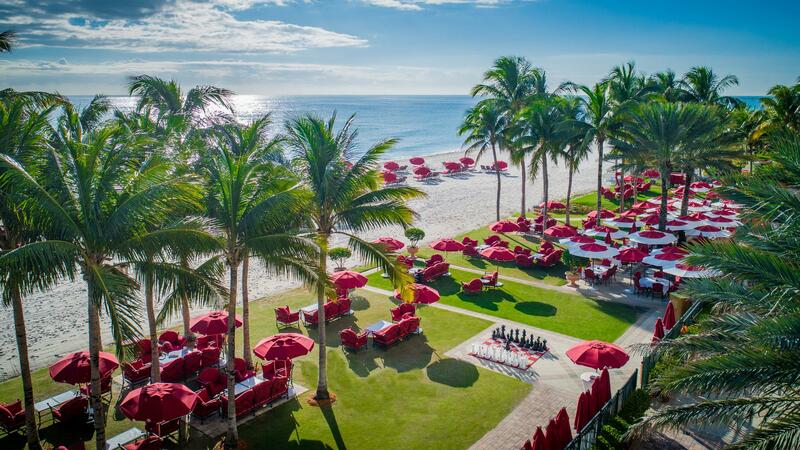 Acqualina Resort & Spa on the Beach, an enchanting and intimate resort set on the white sand beaches of Sunny Isles, offers meeting goers a combination of fully equipped, flexible spaces, as well as the opportunity to relax and rejuvenate set against the backdrop of the Atlantic Ocean. Acqualina boasts three oceanfront Miami Beach event veneus– Mediterranean South, Mediterranean Center and Mediterranean North – that can be separated to host intimate meetings or joined to accommodate groups up to 55 people. All meeting rooms are equipped with internet access, an individual sound system and temperate control. Additionally, complete audio visual services are available to create a multi-sensory setting to enhance any meeting or social event. Both the Mediterranean South and North meeting rooms allow direct access to the wrap around private terrace. The outdoor oceanfront Great Lawn area can accommodate up to 200 people for a reception and 150 for a sit-down dinner, while the Front Lawn is the ideal setting for smaller functions. Cabanas are available for full-day rentals. They include personalized service and various amenities to make the guests' day in the sun more enjoyable.Rates for Cabanas and Acquabeds are $150 plus tax. *24 hours cancellation is required to avoid 50% penalty charge. *Rates are subject to change during peak seasons. *July 1st through August 31st rates for Cabanas are $250. *July 1st through August 31st rates for Acquabeds are $250. The children's program at our Miami Beach luxury resort is based out of the 500-square-foot Acquamarine center. The inspiration for the decor was to incorporate the elements of an underwater experience, combining the colors and textures found in the species of the coral reefs of the Caribbean. After a tranquil spa treatment, take a soothing dip in the heated jet pool as water from the roman waterfall caresses your body and eases your mind. As the sun sets, Acqualina transforms into one of the most romantic places in Miami for our guests to experience. Step outside on to the veranda and you feel worlds away from everyday life as the night sky sparkles and waves crash onto the shore. Just steps away from the Atlantic sits tables, where guests can experience a private beach dinner in Miami surrounded only by the flickering of candles and an exceptional prix-fixe menu. Outfitted in the latest in strength and cardiovascular equipment, the oceanfront fitness center, located on the Mezzanine Level, is equipped with an array of TechnoGym Artis equipment. The ESPA Crystalized Steam Room ignites the body's seven chakras or "spiritual centers" through a spectrum of color and light. Light in the form of color is said to balance energies lacking from a person's physical, emotional, and spiritual levels. AQ Bar, adjoining AQ Chop House by Il Mulino restaurant is inspired by the smooth and sultry era of the Parisian jazz movement, the stylish interiors stimulate creativity and intellectual conversations while guests sip hand-crafted cocktails and play chess or backgammon on custom art-inspired game sets. In partnership with Fine Art Mia, an elaborate collection of original contemporary art adorns the walls of the bar creating a gallery feel. AQ Bar provides an excellent option for cocktail hour and pre- and post-dinner drinks. In addition to a high quality wine and champagne menu, guests can enjoy the traditional as well as our mixologist's own unique creations. Acqualina Resort & Spa on the Beach is a luxury seaside haven located on 4.5 beachfront acres in pristine Sunny Isles Beach. The oceanfront Costa Grill is the perfect spot to enjoy a beachside lunch or a light snack or to relax and unwind with a cocktail as the sun sets. The beachfront Miami restaurant serves an array of gourmet cuisine including sandwiches, burgers, and salads in a casual setting. A Boardroom with dedicated audio visual components such asSamsung 65-inch Smart Television, Polycom Sound Station2,Bose 3-2-1 Surround Sound System, Panasonic wirelessphone headset, 3 pop-up hub stations with VGA, Sound,Cat5 and power connections. Cabanas are available for full-day rentals. They include personalized service and various amenities to make the guests' day in the sun more enjoyable. Rates for Cabanas and Acquabeds are $150 plus tax. *24 hours cancellation is required to avoid 50% penalty charge. *Rates are subject to change during peak seasons. *July 1st through August 31st rates for Cabanas are $250. *July 1st through August 31st rates for Acquabeds are $200. In celebration of the Fodor's Choice Gold Award as one of the Best Hotels for Kids and Families in the United States, Acqualina has now made it's children's marine biology inspired program, AcquaMarine available to our Miami Beach hotel guests on a complimentary basis. AcquaMarine is designed and inspired with our ocean and all the sea life within. Children who sign-up for Aquamarine program will become campers and have fun with learning and discovering a new appreciation, love and respect for the sea through educational hands on activities. Campers will utilize computers and iPads to customize their learning experience within each theme. From sizing up whales on the beach to creating an edible coral polyp, campers are sure to have a blast all while learning about the deep blue sea. In addition to the marine biology based program campers will also engage in activities such as sports of sorts, art adventures, teambuilding activities and pool play. The program will offer supervised activities for children ages 5-12. The program includes seven themes: Arctic Fish and Friends, the Colorful World of Reefs, Gentle Giants, Pinniped Pals, Predators of the Sea, Save the Sea, and Sea Turtles. The moment guests arrive at AQ Chop House, their eyes will be instantly drawn to the giant, 1930s art-deco style chandelier that hangs from the soaring ceiling. The sweeping ocean views and natural light pouring in through the majestic windows highlight the handmade walnut dining tables and plush seating. The restaurant will accent the resort's Mediterranean heritage and feature approachable cuisine that blends a modern steakhouse with Italian flavors offering prime cuts of meat, a selection of crudos, and seafood. Menu highlights include sheep's milk ricotta with sea salt & extra virgin olive oil, branzino crudo with blood orange & frisee, grilled octopus, short rib ravioli with sage & butter, grilled fish and prime dry-age meats as well as delectable sides from truffle french fries, broccoli rabe to cream of corn and sauté cauliflower with raisins. The epicenter of spa culture, the Finnish Sauna is designed to naturally eliminate toxins, leaving your body soothed and your mind serene. Located directly on Sunny Isles Beach, we are also conveniently located near: Hollywood, Hallendale, Haulover, Bal Harbour, and the Surfside beaches. YOGiiZA's team of seasoned yoginis and wellness gurus provide a wide array of personalized health and fitness programs including personal training, health and wellness coaching, mat pilates and yoga sessions..
Transportation to Bal Harbour Shops. Cabanas are available for full-day rentals. They include personalized service and various amenities to make the guests' day in the sun more enjoyable. Rates for Cabanas and Acquabeds are $150 plus tax. *24 hours cancellation is required to avoid 50% penalty charge. *Rates are subject to change during peak seasons. YOGiiZA's team of seasoned yoginis and wellness gurus provide a wide array of personalized health and fitness programs including personal training, health and wellness coaching, mat pilates and yoga sessions.Choose from a variety of 75 or 90-minute sessions of the following: YOGiiZA Beachfront Yoga FlowIyengar YogaAshtanga YogaEnergy Cleanse, Breathing & MeditationNaam YogaRestorative YogaBudokon YogaPartner YogaYoga for the SensesYoga Philosophy: Discussion on the Yoga Sutras & PranayamaAll classes and Fitness Coaches may be scheduled through the Spa. Acqualina is pleased to feature New York City’s most acclaimed Italian restaurant, Il Mulino New York. Renowned for its bustling and energetic atmosphere, market fresh daily specials, extensive selection of fine Italian wines and an impeccably polished wait staff, Il Mulino New York is open daily for lunch and dinner and continues its tradition of preparing authentic cuisine from Italy’s Abruzzi region. The moment guests arrive at AQ Chop House, their eyes will be instantly drawn to the giant, 1930s art-deco style chandelier that hangs from the soaring ceiling. The restaurant will accent the resort’s Mediterranean heritage and feature approachable cuisine that blends a modern steakhouse with Italian flavors offering prime cuts of meat, a selection of crudos, and seafood. Menu highlights include sheep’s milk ricotta with sea salt & extra virgin olive oil, branzino crudo with blood orange & frisee, grilled octopus, short rib ravioli with sage & butter, grilled fish and prime dry-age meats as well as delectable sides from truffle french fries, broccoli rabe to cream of corn and sauté cauliflower with raisins. Located nearby, a full sushi and raw bar managed by sushi chefs from North Miami Beach’s famed pan-Asian restaurant, Hiro’s Yakko-San, is available. The oceanfront Costa Grill is the perfect spot to enjoy a beachside lunch or a light snack or to relax and unwind with a cocktail as the sun sets. The beachfront Miami restaurant serves an array of gourmet cuisine including sandwiches, burgers, wraps and salads in a casual setting. 320 Terminal Drive,Distance: 14 miles.